U.S. Ordnance assigned blocks of vehicle serial numbers plus corresponding registration numbers to each manufacturer. The vehicle serial number was struck on the data plate and sometimes to the hull itself. The registration number was painted on the hull side. M2 and M3 series The M2 medium tanks also had the number stamped on both front and rear tow points. The M3 series of medium tanks have the serial number stamped on both the front and rear tow points, but you can trust only the rear numbers, as the final drives were subject to replacement. M4 and M4A1 The tank serial number is only stamped on a plate attached to the lower left hull plate. M4A1 Medium Tanks built by Pacific Car & Foundry (926 made between May 1942 and November 1943): range starts with serial number 3005 and ends with serial number 3930, with a registration number run from 3060572 to 3061497. 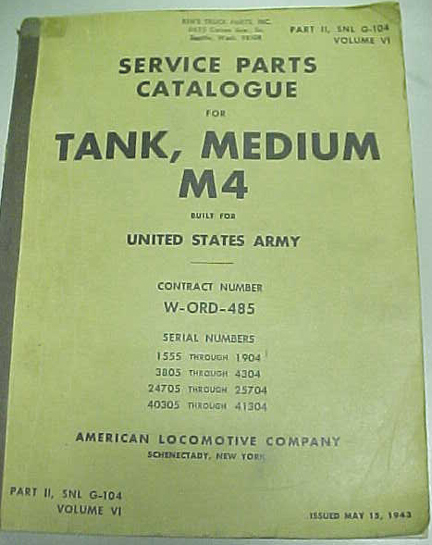 Partial number run on M4A1 Medium Tanks built by Pressed Steel Car Company: Serial Number 1 through Serial Number 164 correlates with Registration Numbers 3014757 through 3014820. 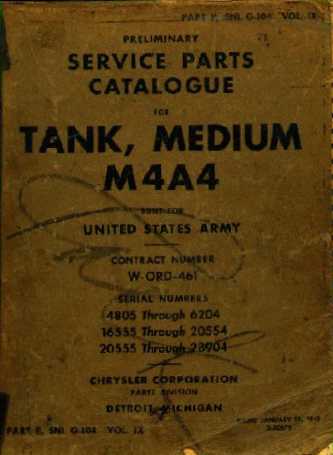 After serial number 164, the company built both M4 and M4A1 Medium Tanks and the serial numbers were given out as the tanks rolled off the assembly line. In other words, there is no fixed serial number run for the M4 and M4A1 tanks built by this company. The highest serial number in their first manufacturing run block that has been observed so far is 1408, with the Registration number of 3016065. (This gives a run of s/n 1 to 1408, registration number 3014757 through 3016065). Data is still collected on a second (and perhaps 3rd) block of serial numbers and registration numbers issued to the company. M4A2 The tank serial number is stamped on the two rear tow points. In 1993 on a Dutch range the serial number 10358 was found on an M4A2 (with welded components) under the data plate (which was missing itself). Registration numbers were USA 3096640 and T-229788. M4A3 Apart from on the data plate, the Ford built M4A3 has its serial number and Ordnance serial number stamped on the rear hull plate. 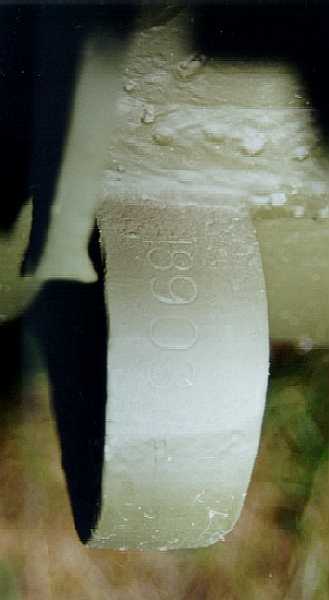 The numbers are stamped on the right side, the smaller of the two numbers is the Ordnance s/n, the larger is the Ford s/n. These numbers are repeated on the right side of the front armour, but you really have to look for it. Also, the Ford s/n is repeated on several of the major parts, such as the mantlet. On the ultimate generation M4A3s built by Grand Blanc Tank Arsenal, the serial number is stamped on the two rear tow points. The Detroit Tank Arsenal tanks are rather problematic. Some of their vehicles have the serial number stamped on the two rear tow points, while others lack any serial number markings other than on the data plate. M4A4 The vehicle serial is stamped on each boss to which the towing shackle is attached. To identify the differences among models, the TM mentions serial number ranges. Note: this contract totals 8,750 M4A4s. As only 7,499 M4A4s were actually delivered, s/n 22653 must have been the last one built. M10 and M36 series The vehicle serial number is stamped on all four hull towing brackets, and on the hull behind identification plate. Canadian AFVs Typically had a Shop No. assigned by their manufacturer, Montreal Locomotive Works. The DND number assigned by the Department of National Defence and the commonwealth type registration number (painted on the hull side) have a relation to the Shop No. Ram Cruiser Tank The Ram I and II have their Shop No. struck on the mudguard support tube which runs across the front of the glacis. CT-205122 - CT-205181 Ram II Command/O.P. Grizzly Cruiser Tank The Grizzly was a Canadian built M4A1 with some modifications. Most notable was the fitting of CDP tracks. The Grizzly has its Shop No. struck below the General Steel Castings Co. crest on the front glacis. It is often repeated on the bolt flange of the final drive assembly. Shop No. 's range from 1 to 188. Sexton 25pdr SP Gun The Sexton's Shop No. is on the rear hull, struck below the starter handle hole. Shop No. 's range from 1 to 2150. Examples have also been found on another ex-French Army M4 ("ABS No 380-1950"), and ex-French Army M10 and ex-German Army M7B2s ("ABS No 4 1961", "ABS No 13 1961", "ABS No 38J 6-1962"). "A-BS" or "ABS" stands for Etablissement d'Etudes et Fabrications d'Armement de Bourges. Serial number "18204" stamped on towing shackle bosses, originally done by Chrysler at the time of manufacture. This number is repeated on the glacis plate by the French or Israelis. It appears to be a stamped rectangle about 1.5" by 3" with the word "CHASSIS" and "N 18204" underneath. It is located on the right side of the glacis plate, inboard of the ball mount about 2" and about 9" above the transmission housing mounting bolts. A three digit serial "001" welded on by the French or Israelis to the left hand side of the glacis plate. Other M50s have a similar three digit number welded on the upper rear hull plate. Israeli registration number 157609y (most recent paint) and 157605. Typically, the Israeli registration is a six digit number painted (and/or welded) in white on black the hull front and rear. "CN-75-50" stands for the gun type, "IS" is unknown, "NO 104" is the gun's serial number, "ABS" stands for Etablissement d'Etudes et Fabrications d'Armement de Bourges (where the first batch of M50s was built), 1956 is the year the gun was built. Table of known serial numbers Click here to view a listing of all known Sherman serial numbers. If you can add anything to this table, please e-mail me. Source: Special thanks go to Mr Charles Lemons, curator of the Patton Museum. Further sources were TM 9-731A; TM 9-745; TM 9-754; TM 9-752 (25 November 1943); Hanno Spoelstra.